We take special attention to carefully apply our makeup. Foundation, blush, shadow, mascara etc. What about when it’s time to hit the sac? Please, Lord baby Jesus, tell me you don’t sleep in your makeup on a regular basis. Once in a drunken blue moon, it’s bound to happen. Sure. If you commit this beauty crime frequently, however, your makeup will settle in your pores. This buildup of gunk will not only cause breakouts, but it will burrow itself into your pores and cause them to EXPAND! You’ll spend your days buying and applying products to rid yourself of your giant pores, which could have easily been prevented in the first place. On those rare nights when you don’t fully wash your face, makeup removing wipes are better than nothing. Makeup removing wipes, however, should never and I mean NEVER be your cleansing method on the regular. They don’t get nearly all of your makeup off, and you’ll still have old makeup crammed inside your pores. Ew. Here are the steps you should take morning and night to keep your skin clear, healthy, and primed for makeup application. Nighttime cleanser: Using your chosen cleansing tool, wash your face with a cleanser specifically labeled as a makeup remover. Cleansing oils are great at removing stubborn makeup. If you wear waterproof eyeliner or mascara (although even some non-waterproof formulas), you’re going to want to also use an eye makeup remover. These formulas are made to be gentler on the sensitive eye area. So you can get all that makeup trapped in your lashes, without irritating your eyes. To ensure a super, duper clean, wash your face with makeup remover to get most of your makeup off. Rinse. Then wash your face again. This is called “double cleansing.” This second wash will remove all the final traces of makeup. 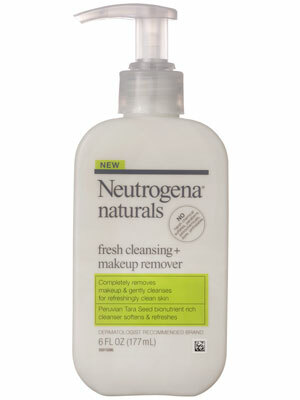 I personally love Neutrogena Naturals Fresh Cleansing + Makeup Remover. It doesn’t have a lot of skin irritating ingredients like sulfates, pthalates, or parabens, plus it gets rid of every little trace of makeup! You might be thinking that toners or astringents are only for super oily or acne prone skin. Not so, my friend. There have been many advances in the world of toners, and there are now a lot of products for those with dry skin. These are often called “softeners.” Now, I will say that toners are not 100% necessary. If you really want to skip this step, you absolutely can. Toners, which are liquid that are applied to the face with a cotton pad or your fingers, deposit ingredients on your face to prep you skin for your serums and moisturizers. Serums are essential components of your skincare routine. They are formulated with small molecules of potent ingredients than can travel much deeper into your skin than a moisturizer. Serums are your first line of defense for signs of aging. I recommend starting to use a serum in your early 20’s. There are lots of ingredients to look for, and it really depends on what your skin can handle and what level of treatment you’re seeking. If you don’t yet have any signs of aging, look for products geared towards preventing aging. This will deliver light levels of antiaging ingredients that won’t irritate your skin. If you’re looking to correct current signs of again, look for products that are more corrective and powerful. These products will be stronger and are meant to provide more immediate results. Even if you’re oily, you need a moisturizer. Again, cater the moisturizer’s ingredients to the needs of your skin. Antiaging. Skin brightening. Calming. Mattifying. There are tons of options. I will say, though, that more oily skins types should stick to lotions/gels and drier skin types should look for creams. You can have different washes/serums/lotions/creams for day and others for night. There are also lots of peels, exfoliants, and masks to use on a weekly basis. I say, get into the routine of competing your comprehensive skincare regimen twice a day. Once you’re committed and keeping it up, then look to customize it further. You don’t want to end up buying a ton of products, get overwhelmed, and end up shoving them under your sink, never to see the light of day again. Baby steps.